Based on wiretaps, police determined that Settimo Mineo was elected head of a reconstructed "cupola," or provincial mob commission, during a May 29 meeting in Palermo. 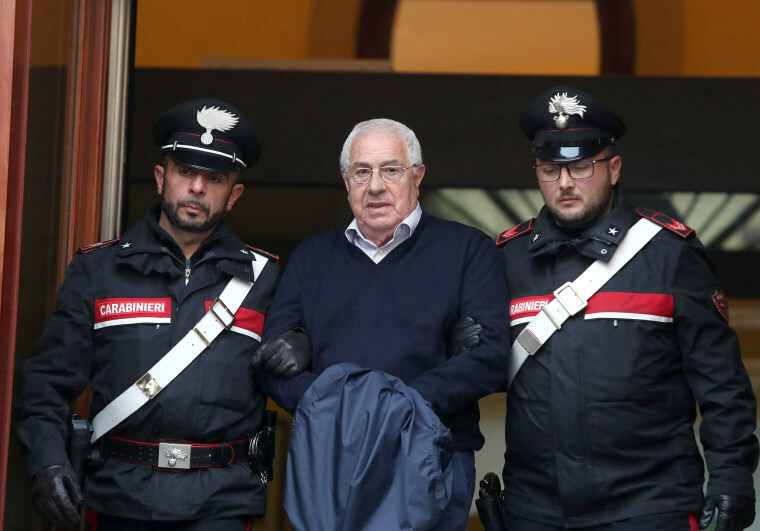 ROME — Italian authorities said Tuesday they had dismantled the rebuilt upper echelons of the Mafia in the Sicilian capital by arresting 46 people, including the man presumed to have taken over as provincial kingpin after the death of "boss of bosses" Salvatore "Toto" Riina. Based on wiretaps, police determined that Settimo Mineo was elected head of a reconstructed "cupola," or provincial mob commission, during a May 29 meeting of clan leaders in Palermo. It was the first time clan leaders had gathered in such a forum for years, and followed Riina's November 2017 death, prosecutors said. Italy's chief anti-Mafia prosecutor, Federico Cafiero de Raho, said the election of Mineo, 80, was significant because it showed that the center of power of Cosa Nostra had shifted to Palermo. Under Riina, its longtime base was Corleone, the Sicilian town made famous by writer Mario Puzo when he used Corleone as the main character's name in his 1969 novel "The Godfather."